It's been a super long week teaching. Day in and day out you are pouring out your heart and soul into your kids. Do you often feel like you just need a break? Maybe even some sanity...or how about some adult conversation? I just found out about this new website called, Groupon. 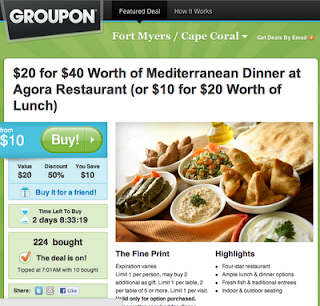 Signing up for groupon is FREE and you will get 50% - 80% off coupons for local entertainment and food in your local city! The best part of all is that it's free to sign up and you can purchase coupons whenever you feel like it. Groupon is great because it gives teachers like you and me an opportunity to explore our own city and find new ways to have fun in a tough economy. Take your family or enjoy a hot date with your spouse without spending a fortune and stay within a teacher's budget!